For years Judy and I talked about replacing our front steps. The wood had become uneven so the steps rock a little as you walk up or down, and the metal railing no longer fit with our taste, they came with the house forty years ago. It was time to replace the steps. We drove around town and looked at what other people had done with their entries, then picked out a design that fits our house. In a flurry of Joe-Homeowner activity, I knocked them apart and piled up the pieces before having Trevor come over to install the new steps. In the process, I realized that the sidewalk under the old steps didn’t match the footprint of the new steps, so I’d have to take out the old concrete, too. It’s not that big a deal, just break up the concrete and add it to the construction debris. This was the right thing to do, as new footings would give us a more stable entry. The size of the footing underneath that small square of sidewalk surprised me. It required a bit more digging than expected. Clearly, it was the wrong shape for our new front step, so I kept on digging. That’s when I discovered that the footings were far larger than my wildest imagination allowed. A concrete wall extended back under the porch, and both ways along the front of the porch. I kept digging around all this extra concrete. Looking up, I realized that the entire front porch was made of stone, too. Beautiful sandstone. What I thought were footings for the steps really turned out to be a long, curving wall, heading east towards the driveway. It was several feet high and well done. The stone extended up the front of the house, three stories high, with dramatic decorations all along the roof line. Decorations included carved stone gargoyles, pineapples, and thistles. Everything was lifelike, as much as weathered stone could be lifelike. Then I noticed large stone vases on each corner of the house, framing winding exterior staircases leading somewhere. I’ve been digging for some time now, trying to get those blasted footings out so I could start the new steps. Could I just take a short rest? I sat down on a stone chair I had found buried in the front yard, beside the footings, and sat quietly for a moment. The gargoyles didn’t like me sitting down. No sir, they didn’t. They expressed displeasure in the best way a stone gargoyle could. No, not rainwater. They started with taunts and quickly launched into throwing stones. Not big stones, small ones, big enough to hurt. I tried vainly to hide behind the walls. I looked up, trying to figure who was throwing the stones. (Gargoyle can’t throw things, right?) The sky had turned dark. Had I been working that long? Was it night-time already? I could see stars in the sky over the house. The gargoyles have stopped throwing stones, but now more stones are coming from somewhere in the sky. I can see larger stones throwing smaller stones at me. There’s something strange about those stones in the sky, starry stones. Each large stone hovering in the sky has little stars on it. A dozen or so starry lights adorn each of three larger objects, the lights are arranged in an X pattern, each leg five or six lights long. Well, not exactly an X, more like a circle of lights. The lights are not a point, they are rectangular. Maybe they’re shaped in a circle of curved rectangles, turning, rotating. Maybe they sparkle with a little color? What I thought were stones in the sky are really saucer-shaped things. Each saucer moved slowly to the east, hurling stones my way as they descended towards me. The stones they throw are large, far larger than what the gargoyles threw, and they leave a trail of dust or dull smoke. Each one thumps on the ground close to me. The stone walls of the house have grown while I watched the sky. Though the gargoyles are no longer throwing stones at me, some have jumped down to the ground, picking up the stones hurled from the flying saucers. They threaten me with their new-found stones. I didn’t go back to sleep for a long time. Judy and I had another event to mark time by, perhaps a new section in the book, or maybe the next volume in a series. Our Blue Lady just rolled out the driveway, never to return. If you’ve read this blog long, you maybe remember Jim talking about his hitchhiking experience in the early fifties. Someone in a 1953 Cadillac sedan picked him up in the middle of the night on a deserted road in the mountains of Virginia. He loved Cadillacs after that. I inherited that love, partly because he taught me how to drive in a 1952 Cadillac coupé. I bought that car from him to take to college and into our first year of marriage. I learned a lot in college, and not just electrical engineering. My friend Brad showed me how to rebuild a carburetor on the ’52. Another friend helped me install new brake shoes on our ’65 Mustang. We did it in the parking lot of the engineering campus. The chairman of the electrical engineering department, “Father Ed,” let me use his garage and tools to rebuild the heads on that same Mustang. Those experiences hooked me on getting my hands dirty working on cars. Cars in that era required a lot of maintenance, and we had little money, so I ended up doing a lot of the work myself. Tune-ups, oil changes, wheel bearing packing, and much more. We loved our ’52 Cadillac and drove it thousands of miles, including trips to visit my family in Denver. It started giving us trouble when a back wheel fell off. Then the driveshaft went out of balance. Then the transmission rear seal started leaking. We decided to move on, and sold the ’52 Cadillac for a ’65 Mustang. On a sunny spring day in 1987 eleven young men met at Rochester’s Silver Lake Fire station to ride with the wind for the eighth Occasional Tri-county Tailwind Tour (TTT). You can read much more about the first tour in my 2015 post, Tri-county Tailwind Tour. After each ride, I tried to capture the moment by writing about the day. The summary for this ride is longer than most, and it captures much of the excitement and pure joy of enjoying a spring day, with no goals beyond having fun and looking forward to beer and pizza after a successful ride. One thing made my memories of the day special. A T-shirt. Several years after the ride, Judy and I happened through Urne and stopped to revive some memories at the bar where we ended the ride. 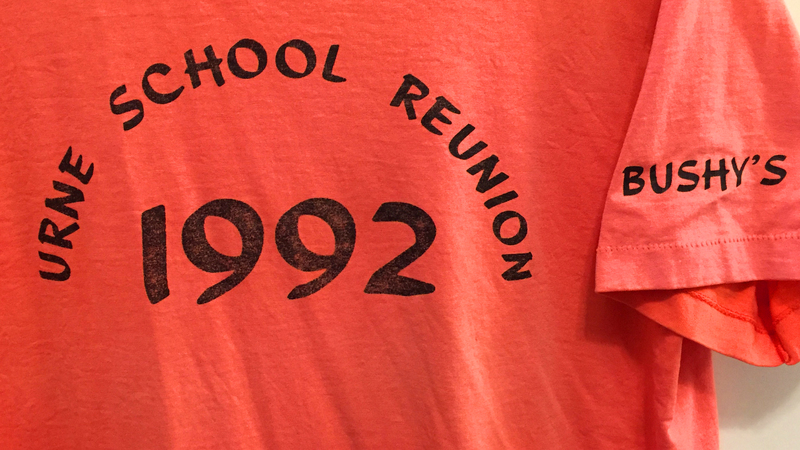 We bought a left-over souvenir from their school reunion. I wore the shirt proudly. It is no longer part of my primary wardrobe, but gets used for yard work. Bikers: Don Fearn, Dan Johnson, Guy Havelick, Brian Good, Mike Dvorsky, Bill Fiandt, Lyle Grosbach, Jerry Berding, Tom Walker, Lonnie Olson-Williams, Jeff ? The weather had not cooperated with the TTT for a couple of years. We remembered the spring ride of 1987, not for rain, but for sunny and warm weather … and this time it felt almost too good. Clear and 65 degree weather greeted us at the fire station at seven AM. Everybody showed up in plenty of time, even the two new guys. They were real biker types, complete with equipment. Jeff had panniers, Lonnie with helmet, high-class biking shorts and all. But they enjoyed riding with all of us pikers. No problem. I like clocks. Those of you who know me well know that I do not like being late. I stay on time by watching the clock … in a good way. As a child I liked clocks, too. I liked to take them apart. Sadly, I wasn’t very good at putting them back together. I took apart both electric clocks and the wind up variety alarm clock. What did my mother think? Were they old clocks that didn’t work anymore? You and I both know that workaday clocks generally don’t just wear out. Maybe she gave them to me to play with? Or maybe I just took them to the basement without asking. As a boy, I spent untold hours at the library looking for books. My mother let me go to the library alone as early as age ten. Within a couple of years I’d bring home three or four books at a time, read them in the evening, and head back the next day to get a couple more. Over a summer I could read stacks of them. In between books, I’d have a dozen or so magazines at home to read, too. The magazines included everything from MAD to Science News, a weekly digest of the latest in science. I started reading that one in Junior High. The reading habit I picked up as a child has served me well ever since. We see them everywhere downtown. This is Rochester, home of the world-famous Mayo Clinic. It’s common for us to see a person in a wheel chair, often sporting a tied scarf to keep a head warm. The hair was probably lost due to a difficult treatment for some medical condition. I always feel bad when I see a wheel chair pushed by a parent. The parent of a child. A young child, often not even double-digit years old. A child facing life and death. Far too soon. That kind of thing isn’t supposed to happen, but in Rochester it’s not that uncommon. It never occurred to me that another situation would hit me even harder than a sick child in a wheel chair. It wasn’t that many years ago that we buried my Dad and Judy’s mother. They were old. Eighties. Life had been good to them, but it was over. We hated to see them go, but that’s the way of life. I didn’t see the next one coming. Those of you who know me know that I spend an inordinate amount of my life wandering the halls at the Mayo Clinic, too. I’ve been lucky that my challenges responded to proper treatment. My life is good. I do what I want, when I want, and the bumps from minor medical mishaps enhance, not detract from, my life. That sounds like fun. Let’s do it! We loved her new way of doing things, partly because it meant we got to do more fun things with our friend. I’ve since realized that the change she made taught me an important life lesson. Unconsciously I’ve been following a similar strategy for years. Recently saying “Yes!” to new opportunities has become more intentional and frequent. Three episodes come to the front of the line as I think about saying “Yes!” In college, one of my buddies in the next room in Sevrinson Hall asked me if I’d like to take his cousin to the prom, because she needed a date. It would have been easy to say no. What kind of loser decides she needs a date to prom, a week before the big event? There were plenty of parties with my other college buddies that could fill up the weekend. I should have studied for finals. But what the hell? I took the bait, and ended up marrying Judy the next year.